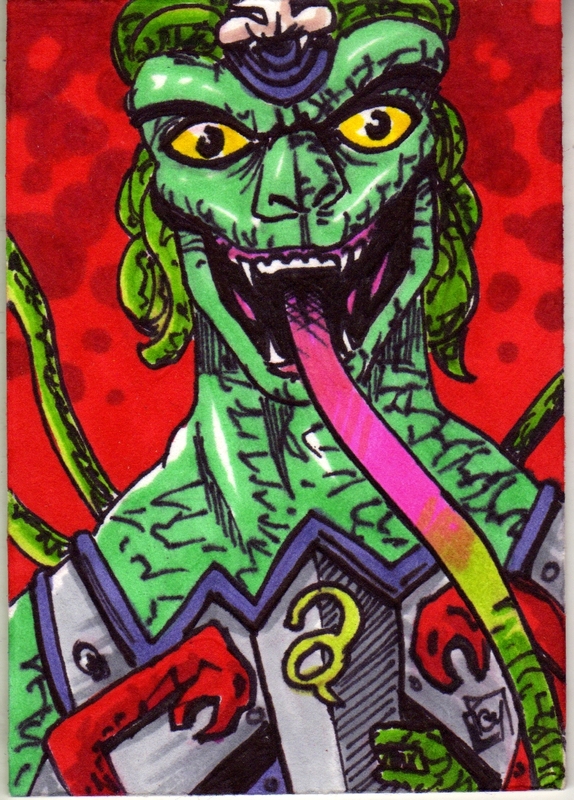 Taylor's Sweet Little Art and Nerd Site: Sketch Card of the Day- Snake Face! Today's deviation is Snake Face! I know that this guy is essentially a male remake of Medusa, but I was so excited to see him in the 200X cartoon when the snake men escaped from the void! When I saw the vintage Snake Face figurine as a kid, I thought he was really cool. I love the fact that he would have snakes come out of his eyes, mouth and neck with a little switch on his back. The idea was that when the snakes came out of his face he would freeze his enemies with fear and turn them to stone, just like Medusa! As with many other characters in the Masters of the Universe franchise, the creators pull from different mythologies and make something quite a bit fun. When the 200X cartoon aired, I was happy to see him with the snakemen. In the 200X series cartoon, he was presented as this regal, more human shaped snakeman. Instead of the snakes coming out of his face, his face would light up and snakes would uncoil themselves from his hair. Correction. I should say that his hair WAS the snakes. He did have one snake come from his face, and that one would be his tongue. So, in the vain of the title "Snake Face", he still had one actually come from his face. So, needless to say I was excited about getting a Snake Face action figure once I saw his other snake men brothers made in toy form. (Kobra Khan, King Hsss, General Rattlor) Unfortunately we never got one. We did however get a Staction figure by NECA. And I have to tell you, the sculpt on it is amazing! It's a beautiful piece! I was never able to get one of the staction figures. He's pretty rare so I doubt I ever will, but I haven't given up on the fact that MOTU fans might get a really cool action figure of this character in the Classics line. I just hope he is presented with both possibilities of Snake Face! You know, one with snakes coming out all over the face, and one that's a bit more tamer like the 200X version. 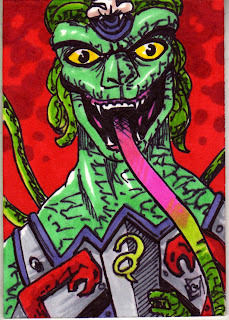 I know it might be asking a lot, but a boy can dream... You can also see this sketch card here.